The beautiful homes of Windsor Hills are nestled within The Woodlands, a master-planned community approximately 40 miles north of Houston, near Conroe, Texas. Being an age-restricted community, Windsor Hills offers many amenities and activities geared toward active adults aged 55 and better. The goal of Windsor Hills is to provide comfortable, low-maintenance homes which allow residents the freedom to focus on the activities they enjoy most. Nature lovers are at home amid Windsor Hills' mature landscaping, native yaupons, tall pines and hardwood trees. The Sam Houston National Forest and Huntsville State Park are merely a 30 mile drive to the north and the W. G. Jones State Forest is located just to the west of the community. Surrounded by nature, Windsor Hills offers many beautiful walking paths as well as a variety of both indoor and outdoor activities. Being located beside The Woodlands all-age communities makes Windsor Hills an ideal location for grandparents who want to reside near their children and grandchildren. Activities at Windsor Hills begin at Club Windsor, the community clubhouse which is open exclusively to Windsor Hills residents. The clubhouse features a fitness center with treadmills and weight lifting equipment for individual workouts or group fitness classes. The billiards lounge is a popular meeting place to shoot pool, play a game of darts, watch TV or simply sit and talk. An arts and crafts room allows residents to participate in art classes or work on their own creations, while the library and computer room offers computer workstations for community use. The large multi-use room, complete with catering kitchen, is an ideal location for both community events and private parties. Windsor Hills' social groups make good use of this multipurpose space by hosting theme dances, games, and other events for residents. This beautiful clubhouse features an outdoor resort-style pool and spa area. Long, winding paths stretch across the community for outdoor walking or jogging amid the beautiful community landscaping. Windsor Hills offers 437 single-family homes. Windsor Hills was built by Lennar Homes between 1999 and 2002 and only resale home opportunities remain. These sought after one and two-story, single-family homes are surrounded by mature landscaping and lush woods. Windsor Hills luxurious homes range in size from 1,733 to 2,738 square feet. Homes are set on parcels that average a quarter of an acre, and lawn services are provided by the community. Homes in Windsor Hills offer many design luxuries including open floor plans, high ceilings, gourmet kitchens, deluxe master-bedroom suites, hardwood flooring, crown moulding and large walk-in closets. Sunrooms and large patios are common in Windsor Hills, allowing residents ample space to enjoy the natural beauty surrounding the community. Windsor Hills relies on its residents to actively support and shape the culture of the community. Windsor Hills was also the first community to establish a Firewise Committee in southern Texas. This important group works to protect the surrounding forests and communities from fires. Residents looking to socialize can share their interests in one of the community clubs. Windsor Hills offers several social clubs, including the garden club, French club, and bridge club. Movie nights and Thursday ping pong nights are some of the more popular clubhouse events. For men, there is a ROMEO (Retired Old Men Eating Out) lunch group. Various trips, parties and other social events are planned regularly. Residents can also register for various ALL (Academy for Lifelong Learning) classes which are offered at the clubhouse through a program at Lone Star College. The Woodlands master-planned community features a shopping mall and several golf courses. Two of these golf courses, The Oaks and Panther Trail courses, reside on the property of The Woodland Resort. This four-star resort has hosted many golf events, including the American Junior Golf Association's Easter Event and is a luxury retreat for many vacationers each year. For music lovers, The Cynthia Woods Mitchell Pavilion hosts performing arts and musical programs, and has been a venue for the Houston Symphony, Houston Ballet, Frank Sinatra, Bette Midler, Elton John and more. 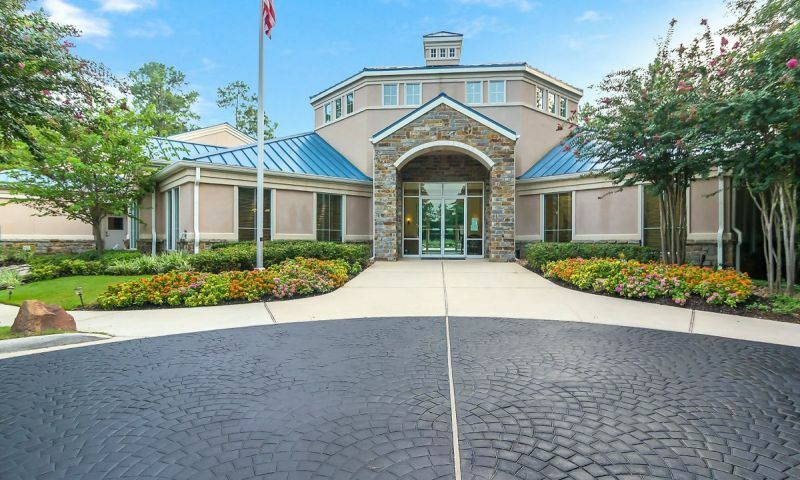 As the community is a part of The Woodlands, Windsor Hills residents can participate or become members in its many clubs and activities as well as those offered through their own Club Windsor. Two state-of-the-art hospitals serve The Woodlands communities: Memorial Hermann The Woodlands Hospital, and St. Luke's The Woodlands Hospital. World-class doctors have offices at each of these hospital campuses. Private practices and emergency care facilities are also available throughout The Woodlands. Windsor Hills is the ideal active adult community that is set in a quiet, wooded area yet is close to daily conveniences near Houston, Texas. Club Windsor - 23,000 Sq. Ft. There are plenty of activities available in Windsor Hills. Here is a sample of some of the clubs, activities and classes offered here. Windsor Hills was built by Lennar Homes between 1999 and 2002 and only resale home opportunities remain. These sought after one and two-story, single-family homes are surrounded by mature landscaping and lush woods. Windsor Hills luxurious homes range in size from 1,733 to 2,738 square feet. Homes in Windsor Hills offer many design luxuries including open floor plans, high ceilings, gourmet kitchens, deluxe master bedroom suites, hardwood flooring, crown moulding and large walk-in closets. Sunrooms and large patios are common in Windsor Hills, allowing residents ample space to enjoy the natural beauty surrounding the community. Windsor Hills is a pretty nice neighborhood. We really like our home and have spent a lot of time creating a beautiful backyard. I love to garden so it's been fun creating such a beautiful space. It's great to entertain friends with dinner out on our patio and it's fun to see what our friends create in their own yards. We share a lot of ideas and tips. 55places.com is not affiliated with the developer(s) or homeowners association of Windsor Hills. The information you submit is distributed to a 55places.com Partner Agent, who is a licensed real estate agent. The information regarding Windsor Hills has not been verified or approved by the developer or homeowners association. Please verify all information prior to purchasing. 55places.com is not responsible for any errors regarding the information displayed on this website.